Is your mane agenda for today a messy bun, a casual top knot or a classic side bun? Well, how perfect is that? Today we’re going to tell you about our amazing hair accessory that will give you the best looking, most secure and comfortable bun in minutes, no matter your hair type! Sock buns? Hair donuts? Bobby pins? Give them back to your Grandma. There are tons of ways to create a bun: multiple elastics, bobby pins and hairspray; DIY hair donuts (cutting a hole in your socks...really? ); pre-formed donuts that sell for $5; bun makers that are two slap bracelets sewn together that snap into a circle shape before you get it close to your head. We've seen it all. YouTube probably has hundred of how-to videos for creating a bun, or you could even ask your Grandma, cause that's how old those accessories are. Now, there’s a much easier and faster way to create the best looking bun! Ditch those old-fashioned hair styling tools and accessories. Bun Barz, a revolutionary hair accessory from Pony-O, puts them all to shame. Women AND children with different hair types have been raving about the Bun Barz. It doesn't matter if your hair is fine or thick, curly or straight. Even if it's chin-length, Bun Barz will hold it without the use of elastics, bobby pins, donuts, socks, etc. Because of the way you create the bun, rolling it up in your hair, and the fact that it's available in hair blending colors, nothing peeks through, even in fine hair. Just like it’s sister, Pony-O, the Bun Barz will give you style, security and comfort. The malleable metal inside the two pieces is easy to shape, but strong enough to hold your bun in place all day. The silicone coating is hair friendly: no pulling, tugging, or damaged hair. Your hair will also look fuller compared to socks and donuts. When you create a bun with donuts, socks, or the slap bracelet, you STILL use elastic hair ties and bobby pins that damage your hair. Bun Barz is elastic-free and bobby pin-free. To remove the Bun Barz, unfold it from the bun shape, and it comes right out without damaging or pulling your hair. No creases! But, you might have some nice curls! 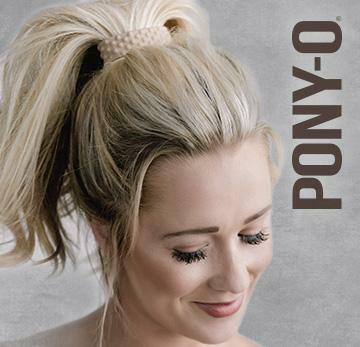 TIP: If you need a more secure hold, use your Pony-O to create a ponytail, THEN follow the steps for creating a bun. The hold is amazing, and even more comfortable and full. Center your hair between the two bars. Hold your hands on each side, kind of like bicycle handles. Clamp the bars down at your shortest layer. If your hair isn't layered, sliding the Bun Barz a little more than halfway on your hair is far enough to hide the ends. No need to go the whole length of your hair. Roll the Bun Barz toward your head. Bend each side in toward each other, creating a circle shape. Squash the Bun Barz to secure it. Wrap your hair around to cover the bar (this also helps to secure the bun). For more volume, pinch the hair where the ends of the Bun Barz join (so the bun doesn't open up) and gently tug your hair outward to create a bigger bun. When your bun is the size you want, make sure to squash the Bun Barz again. Your bun game has just been changed and taken to the next level to stay! There isn't a more versatile or more comfortable bun-maker on today's market. Any bun you create with a sock or donut form, you can create with Bun Barz, and then some. Be sure to check out our unique Bow and Heart buns on Instagram! Questions or comments? We'd love to hear from you!